Ivory Coast scored two goals in as many minutes to come from behind and get their World Cup campaign off to a winning start with victory over Japan. The Elephants trailed to a stunning Keisuke Honda strike in the first half. But the introduction of Didier Drogba as a substitute inspired the comeback, with Wilfried Bony equalising after meeting Serge Aurier’s cross. Aurier also provided the cross for former Arsenal forward Gervinho to head home the winner. The victory at Recife’s Arena Pernambuco moved Ivory Coast level on three points at the top of Group C with Colombia, who beat Greece 3-0. Ivory Coast, appearing in their third World Cup, have never gone past the group stage but will fancy their chances after a spirited performance. However, it all looked to be going wrong for manager Sabri Lamouchi, who surprisingly left out former Chelsea striker Drogba and saw his side fall behind. Asian champions Japan – the first team to qualify for the World Cup – were sharp and nimble in possession and took the lead with a goal of real quality from Honda on 16 minutes. The AC Milan midfielder collected a pass across the box, took one touch and then drove home powerfully into the top corner with his left foot. Ivory Coast had their moments, with midfielder Yaya Toure showing occasional glimpses of his destructive power, while Bony was guilty of wasting several chances. But shortly after Drogba’s introduction, the Swansea strike equalised, leaping to glance a fizzing Aurier cross into the far corner. Two minutes later, another drilled Aurier centre was met by Gervinho and his header squirmed past Japan goalkeeper Eiji Kawashima. Drogba twice went close to finding the net in the closing stages as Lamouchi’s side finished strongly to leave Japan with an uphill battle to stay in the tournament. “The players are very happy with the victory but we are far from being qualified. “We did not start very well in the game, conceding the first goal from a careless mistake, then we created many good chances. 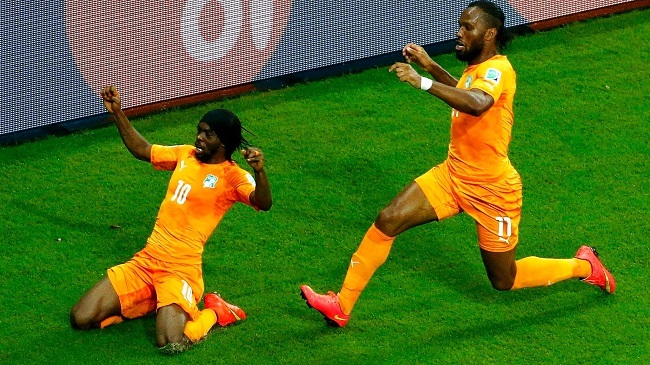 “We have to give credit to the Ivory Coast – they had a great game. “We did not put them under enough pressure. We were not aggressive enough. We could not play as we normally do, especially in the second half after conceding the two goals.